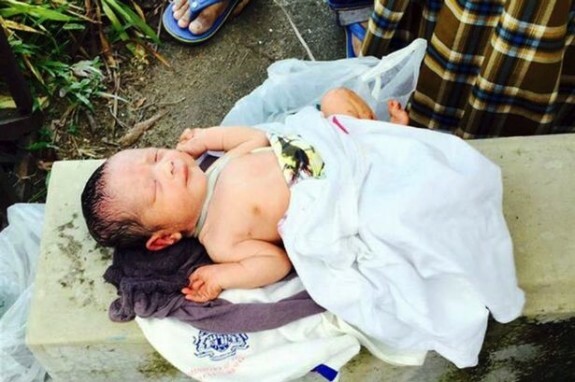 Churchgoers in Malaysia, who believed the crying they could hear was a kitten trapped in the drain, were surprised to find it was a newborn baby. The passers-by had just returned from a local church service when they heard the noise. Expecting to find a kitten, a man saw something moving in a bag next to the drain and found a newborn baby in a bag, who was covered in his own feces and wrapped in a grey shirt. When he was found the baby still had its umbilical cord attached. Shortly after police arrived the baby was transferred to the Kajang Hospital where staff determined he was in healthy condition. Police are now calling on the public to help identify and locate the child’s parents. At the very least we hope that officials are able to find him a good loving family.